Move over, Millennials—Generation Z is the freshest wave of movers and shakers to grace the online marketplace. Just out of high school, these incoming trendsetters don’t know a world without smartphones, they have no clue what a two-hour wait time feel like, and Miley Cyrus probably makes more sense to them than she ever will to the rest of us. However, the standout feature of Gen Z is that they get the majority of their content online. From textbooks to news stories to medical information, Digital Natives rely on the web for everything they do. So what does this mean for the marketing world? Gen Z is familiar with every marketing and advertising tactic there is. Banner ads, SEO, sponsored ads, influencer marketing, and content marketing—they’ve seen it. However, this isn’t a bad thing for your brand. The fact that the Digital Natives know your angle actually makes it easier for you to be direct and tactical, allowing your marketers to shift their attentions toward creating the kind of content that can catch the attention spans of these voracious young men and women. Here are four tried-and-true ways your brand can organically use content to reach the expanding cohort of post-millennials. 2015 was the year of tracking and analyzing the buyer experience and mapping the customer journey. While bounce rates and sales are crucial for understanding your business, looking at the funnel as a whole is a way of organically gathering data on your clientele. From the moment of initial contact, engagement, and into long-term retention, brands are using journey mapping to analyze and fine-tune their entire tunnel through the content they put out. Journey mapping has the power to revamp a brand’s key touchpoints through anecdotal storytelling and visualization. Mapping is a useful tool for focusing on a particular part of the customer story while also giving a broader look at the entire experience. The importance of honing the Gen Z journey is that it allows businesses to adapt to the complexities of this specific group, and to do so before they officially replace millennials in the marketplace. It also forces customer service representatives and business leaders to think of their young and malleable users as more than just case studies, and instead as constantly evolving human beings that want to connect and engage. Much like the the Gen Z customer, journey mapping is introspective. Heavily rooted in understanding the mentality and emotions of a user, mapping is an organic method for consolidating information about each touchpoint. Digitally inspired companies such as Tahzoo specialize in creating roadmaps for companies who are looking to understand their customer’s entire journey in order to drive targeted content. Tazoo offers data-driven perspectives which not only allow businesses to understand the likes and dislikes of their young customers, but help them to become organizationally prepared for Gen Z’s many intricacies. 76% of teens use social platforms. While the debate wages on as to whether or not they’re heavily addicted, you can safely bet money that the content you are sharing across your social media channels will be seen by Gen Z. The holistic approach to social media content curation is perhaps the only strategy that involves a give-and-take between brand and buyer. The logic behind approaching social media holistically centers around the fact that Gen Z loves to share publicly, which means brands can accumulate brand ambassadors without dropping a penny. Create visual content and use links. Explicitly ask them to share. Always be testing content formulas. Great social media marketing begins with a change in mindset toward the holistic, and it ends with major shifts in fully personalized customer engagements and gathering an organic community on your channels. This approach calls for companies to view their content as an ongoing journey, something that changes and grows with your company and clientele. This is why brands are focusing their social media efforts toward storytelling, rather than marketing, to increase traffic and build an authentic community. While your message should stay consistent, what you share should run the gamut of your company’s features, standout qualities, and culture. Data is power, but Big Data is the massive collection of predictive analytics and industry information, a thing much greater than power. One of Big Data’s uses is accruing information about users from within and outside of your website, and to craft content to fit their lifestyles and online personalities. Using predictive analysis, big data offers the numbers to back up the personas and audiences for the content you’re publishing. Big Data companies such as RoundForest allow companies to collect information from their funnel and turn it into actionable data which can lead to implementing brilliant UX and an even better content journey. Big Data has the power to refocus the scope of the entire customer experience. 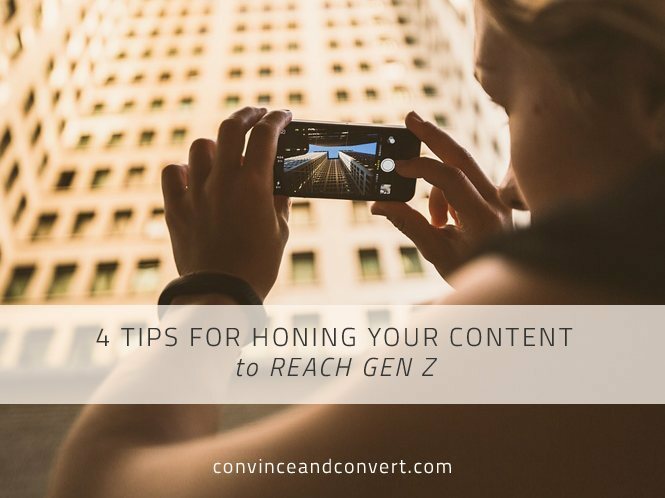 To get the full story about your specific Gen Z audience, speak to them in a voice that resonates. This is why thousands of brands are collecting information using Big Data techniques and turning their findings into brand stories. Mastering big data to better understand your customer’s journey opens a world of strategically curated content. Having stories from every touchpoint within your funnel allows for your marketing and copywriting teams to create actionable information based not just on feedback, but on statistical answers to the “what ifs” that arise when interacting with customers. The current population of post-millennials is at 23 million and rapidly growing. This poses the obvious challenge of figuring out what this massive and diverse cohort of tech savvy humans want from their content, and how you can be the one to give it to them. Persona mapping, or empathy mapping, is a strategic way for brands to gather intel on their customers, so that they can better communicate with each persona specifically. Creating anecdotes for accurate and actionable customer analysis is becoming an increasingly useful process for answering these questions, and its success can impact the customer journey. Persona analysis optimizes your content, as it takes an in-depth look at the likes, dislikes, worries, feelings, thoughts, emotions, and wants of each of your identified clients. This is especially critical for understanding Gen Z, as they spend much more time sharing about themselves online than their predecessors. If you can identify their problems, even before they arise, your EQ will speak leagues to the Digital Natives. Hubspot has an incredibly useful tool, aptly named Make My Persona, for naming and presenting data on potential buyers. The tool asks questions such as, “Does Jack search for vendors online?” and, “What associations and social networks does Victoria belong to?” Having solid archetypes for potential customers is a way of tracking changes, not just in your own marketing, but in your audience’s mentality as well. As Gen Z become the entrepreneurs and buyers of the next decade (and they will), brands’ customer data must reflect these changes if they aim to keep up. The time is fast approaching when Gen Z will take over the B2C and B2B marketplaces. They are the incoming CEOs, CMOs, marketing execs, and industry gurus of the next two decades. Now is the time to begin shifting your business model and company mission to accommodate this tech-centric and information-hungry cohort of digital natives. Having a strong organic content plan and understanding how to use journey mapping, persona identifying, social media, and big data to grow a Gen Z community is your brand’s best ticket to the hearts and minds of the newest generation.